Tyler Johnson is the rare, lucky kid who grew up to play for his hometown team. Liberty Lake native Tyler Johnson hopes to turn pro next year. American players are few and far between in the Western Hockey League. You could probably count the number of Pacific Northwest natives who have made it in the WHL on your hands and feet, and still have a few toes left over. Tyler Johnson breaks the mold in numerous ways. 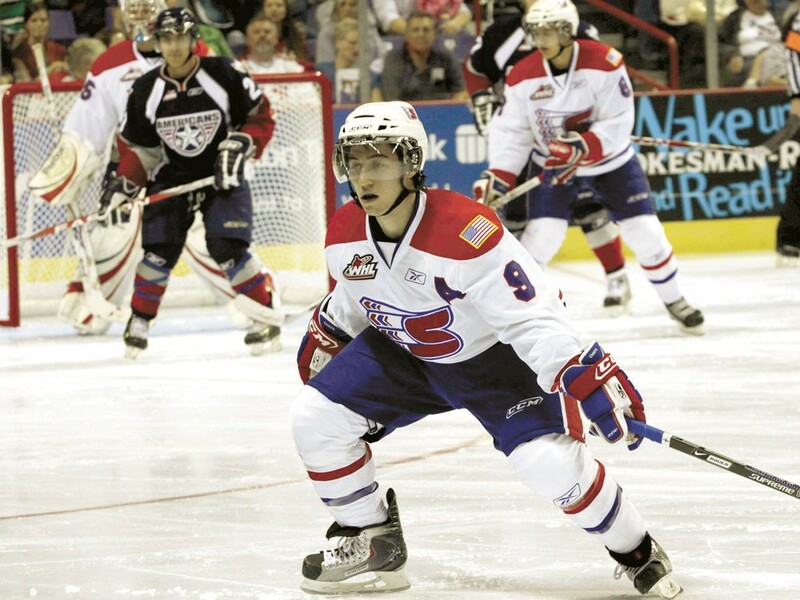 Not only is he an American player in the WHL, he’s a lifelong Liberty Lake resident playing for the Spokane Chiefs. “It’s a dream come true for me,” Johnson says. Johnson doesn’t just play for the Chiefs, he excels. Rarer than Americans in a league filled with Canadians and a handful of Europeans, are American standouts. Johnson is one of them, scoring 35 goals and 71 points in 64 games last year, before his WHL season was interrupted ever-so-pleasantly by a gold-medal run with the U.S. 19-and-under national team at the World Junior Championships. Two years ago, Johnson helped the U.S. take fifth at the World Juniors before the Chiefs captured the WHL championship (he was named the playoff MVP) and the Memorial Cup, the 20-and-under major junior championship of North America. Major junior hockey is the primary feeder system for the National Hockey League. As for those stories about WHL players blowing off school to chase their NHL dreams, consider what Johnson accomplished at Central Valley High School. Ken and Debbie Johnson have plenty of reasons to be proud of their only child. Teachers, coaches and teammates rave about Johnson’s personality, work ethic and character. “He’s a great leader — he has been since he got here,” says linemate Levko Koper. Johnson was on skates when he was 18 months old. By the time he was 4, Johnson was playing in a league where the minimum age was supposed to be 6. “My parents used to tell me I’d stand by the goalie and talk to him the whole time,” Johnson says with a laugh. One of just four Spokane-area natives ever to play for the Chiefs, Johnson has been a regular since joining the club in 2007-08. “He’s a great skater — quick, fast, good top speed,” Levko said. “He sees the ice really well. I think he’s one of the best centers in the league. He knows how to set up guys, and he’s great on draws. Indeed, Johnson is surprisingly adept at fending off opponents, who are often much larger than him. He’s listed at 5-foot-9 and 175 pounds, but admits he’s closer to 5-foot-8 and 170. Johnson’s lack of size hasn’t discouraged Phoenix and Minnesota from inviting him to NHL training camps (2008 with Phoenix, ’09 and ’10 with Minnesota). He hopes to turn pro next year — he’s 20, the oldest you can be and still play junior hockey — and he’s taking online college courses to prepare for a career as an anesthesiologist once his playing days end. Whatever the future brings, Johnson can always revel in his status as one of the few players with WHL, Memorial Cup and World Junior championship rings.